It's hard to not get inspired by such diverse landscapes, from national parks to vineyards, coastline and even golf courses, California has an endless amount of vast and varied scenery to be captured on camera; you don’t need to be a professional either just pick your spot and get creative with the stunning surroundings. For a scenic overload here’s our top 10 most photogenic locations. Point Reyes National Seashore is a stunning section of coastline north of San Francisco. Covering 80 miles of windswept shores it’s a beautiful contrast from the San Francisco city skyline with plenty of opportunities for capturing some memorable images. The lighthouse is a blustery viewpoint with panoramic ocean views, a spectacular place for whale watching and a selfie or two. Hike along the incredible cliff tops for salty sea breezes and an opportunity to take in the beauty of this rugged coastline. Don’t miss the elephant seal colony, these gigantic creatures wallowing in the sand and roaring in the water make for a great image. 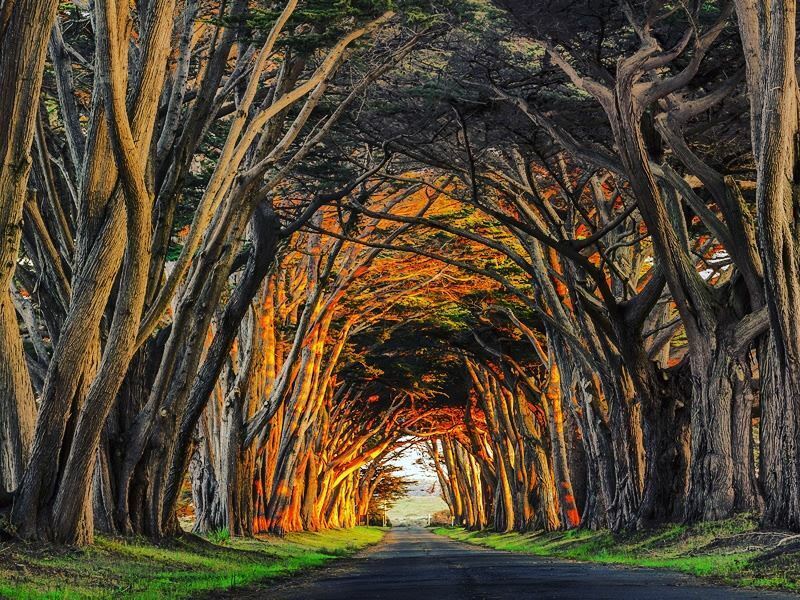 Get the shot: Aside from panoramic sea views Point Reyes has another natural landmark, a stunning cypress tree tunnel, find it on the way to the lighthouse. Best captured early in the morning when rays of sunlight stream through the trees or at sunset for some really beautiful colours. Take a shot looking directly through the tunnel or get creative with different angles, visit on a weekday to avoid the crowds. Surrounded by the Sierra Nevada Mountains this unusual saltwater lake found within the Mono Basin is a distinctive landscape and definitely one like no other. Strange rock formations called tufas protrude out of the lake, you could easily be mistaken for thinking this is another planet. These sharp spires were formed millions of years ago by freshwater meeting the alkaline water of the lake. Calm, quiet, majestic and eerily beautiful, Mono Lake is an ideal spot to stop off on the way to Yosemite. 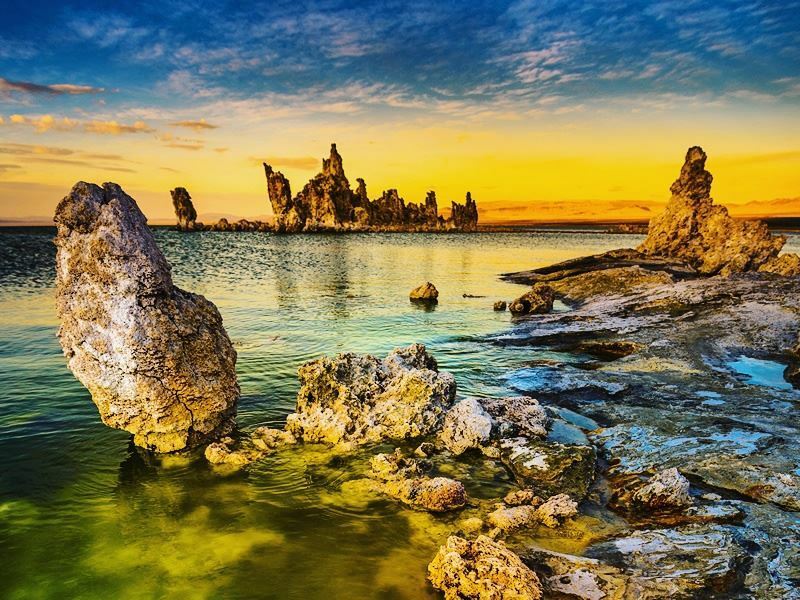 Get the shot: South Tufa has the largest amount of these strange rock formations, get there before sunrise to get some dramatic images, capturing steam rising from the lake will add an eerie feel to your photos. The visitor centre has great views over the lake or walk along the shoreline to get some detailed shots of the tufa. Black Point is a great place to get photos looking down onto the lake and of the surrounding mountainous landscape. 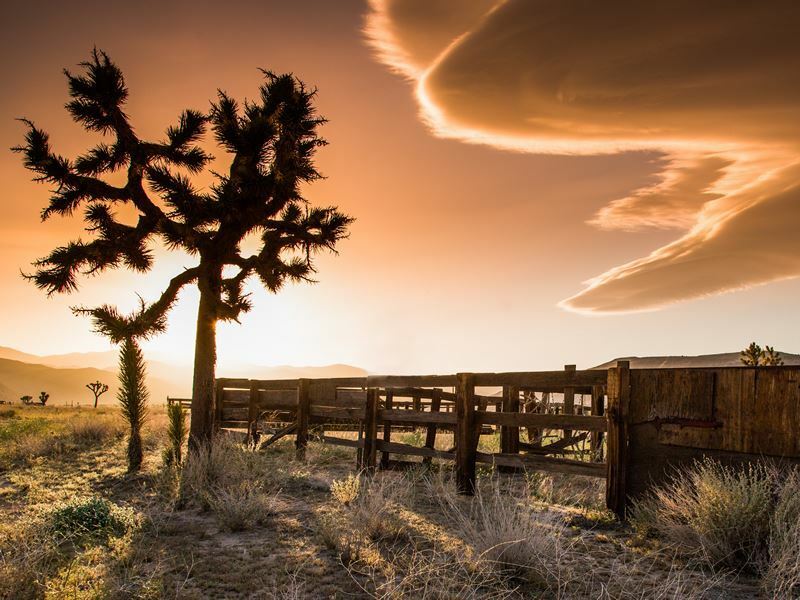 Joshua Tree National Park is named after the many Joshua trees covering the desert landscape and is in fact a giant yucca plant. Rock climbing and hiking trails amongst ginormous boulders are popular with visitors to this national park as is stargazing. With little to no light pollution the night sky is the icing on the cake in this stunning desert landscape. Get the shot: To the north of the park the trees become larger and more densely populated, try taking photos of them at sunrise or sunset this unforgettable vista looks even more unusual with an orange sky. It’s worth exploring to find some good photography spots. 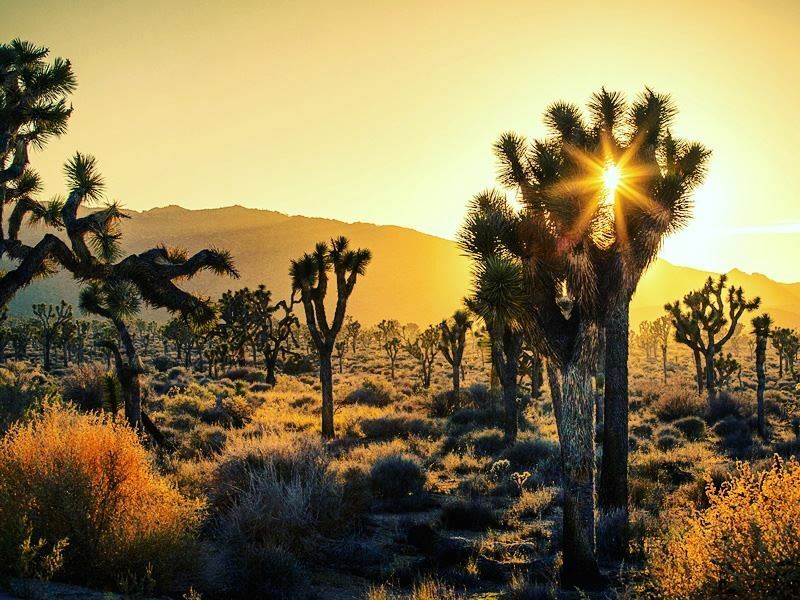 Look out for Joshua trees positioned near giant boulders, two natural things that the park is famous for. For fantastic panoramic views visit Keys View, where this strange landscape is revealed in all its glory. There are some interestingly shaped Joshuas along this route, get down low and capture a single Joshua tree standing tall and proud. Once the favourite hangout of the Rat Pack and known for its retro buildings the desert town of Palm Springs in the Coachella Valley is also a very popular spot for golfers. 110 courses are scattered throughout this area and add a spot of colour to an otherwise baron landscape, like an oasis, lush green grass, palm trees and watering holes all with glorious backdrops are an ideal spot to take a camera and get snapping. Get the shot: Hire some golfing gear along with a golf buggy and tee off with your camera. 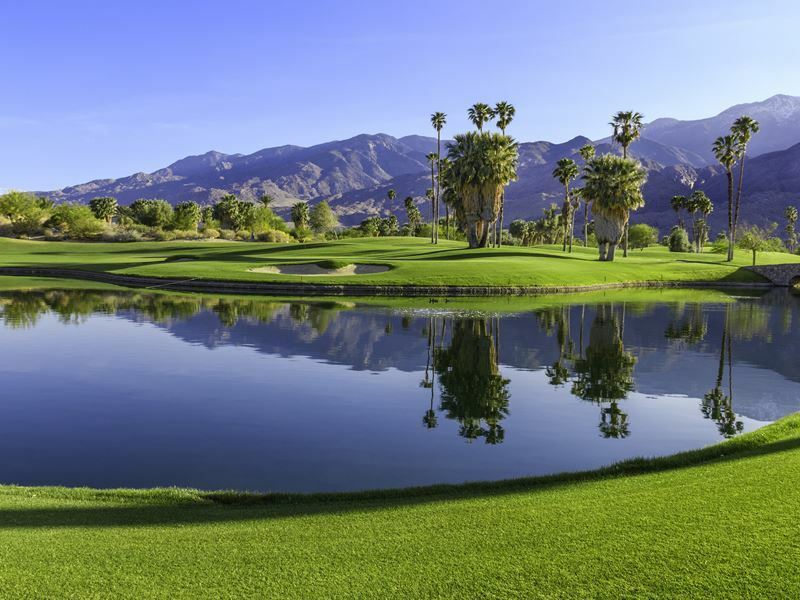 The Players Course at Indian Wells Golf Resort has no roads or houses nearby making it the perfect spot for photos or try Cathedral Canyon Country Club with lakes, tree lined fairways and a picturesque backdrop. In complete contrast to the desert the famous Spyglass Hill has a beautiful coastal setting complete with sand dunes, perfect for juxtaposing images. The iconic Pebble Beach known as one of the most beautiful golf courses in the world is a must photograph, freeways are located right on the edge of the rugged coastline with gorgeous ocean views. 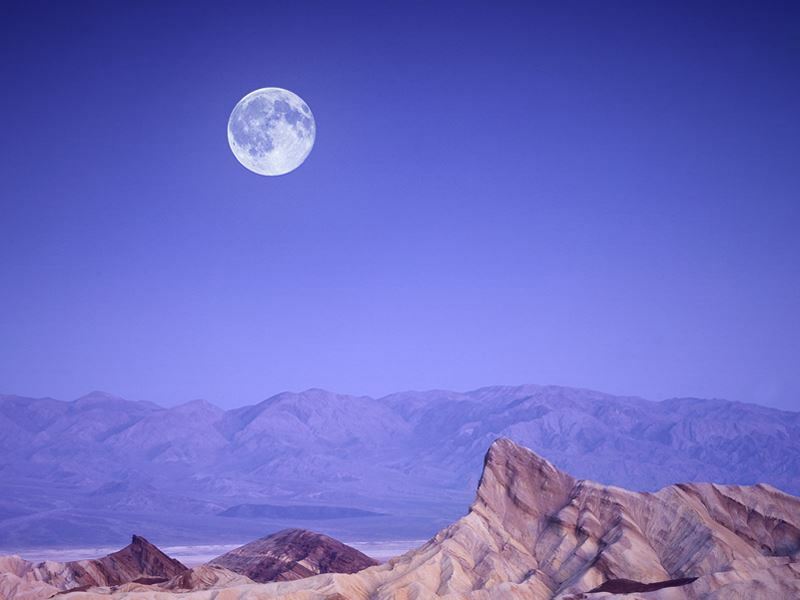 Mars-like in appearance, Death Valley is a photographers dream, sand dunes, extinct volcanoes, oases, canyons and multi coloured earths mean this is a picturesque dessert landscape. Zabriskie Point is a famous viewpoint that must be seen, erosion has caused rock formations to crease and crinkle forming interesting patterns. This scenic viewpoint offers fantastic panoramic views across the coloured Badlands. The lowest point in the park is Badwater Basin at 282 ft below sea level, be sure to take a selfie here to prove that you’ve visited the lowest point in North America. The desert highway or route 190 is a national scenic byway and for good reason, this never ending straight road has dramatic scenery all around, its well worth stopping to take photos of this iconic stretch of road. Racetrack Playa a dried up lake is a very strange location, famous for its moving rocks this is a must for some intriguing photography. Get the shot: Visit Zabriskie Point at sunrise when a golden light casts shadows across the badlands, the colours of the waves and pleats of the rock formations look stunning on camera. Hike into Golden Canyon for an up close view of the strangely shaped rocks and capture on camera Red Cathedral, a rich red rock cliff face. Wine country at its finest, Napa Valley has over 400 wineries and is a good place to quaff the afternoon away. Sample wines in a tasting room or exploring the vineyards on horseback. If that’s too energetic then jump on a Napa Valley Wine Trolley, a unique way to experience the rolling hills and perfectly aligned vines along with wine tasting. Get the shot: For a really special experience and a completely different view take to the sky in a hot air balloon. 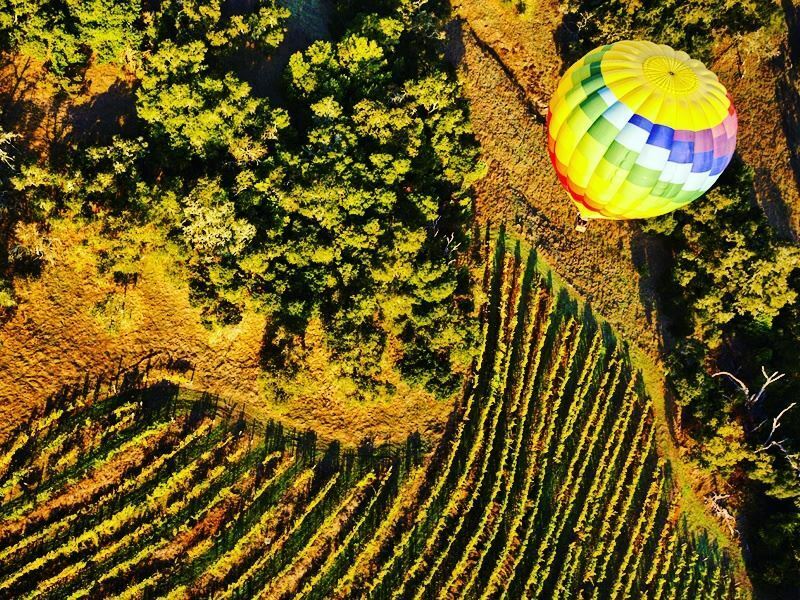 Capture the vineyards, hills and mountains from the air at sunrise, or get up close to the vines on horseback and take a selfie in a tasting room with a glass of wine. Napa Valley is so photogenic exploring by car is a fantastic way to find the perfect spot for a photo. Redwood National Park lies in northern California and is a must for those looking to hug giant trees, there’s plenty here! Ancient Redwoods, some amongst the worlds tallest inhabit this area, although their exact whereabouts are kept a secret. Nearly 200 hiking trails make this a popular park for hiking and mountain biking and with coastline included within the park boundaries there is a lot of exploring to be done. Fern Canyon is an interesting place to explore, 7 different types of fern hang from the canyon walls, mossy and damp this intriguing place is worth investigating. Get the shot: For a panoramic shot of giant redwoods Klamath River Overlook is a good spot, the river meets the sea here and the forest lines the surrounding hillside. While you are snapping away take the time to look out to the ocean for passing whales too. Find a huge tree, any will do and stand right at the base of it, take a photo looking up or to get into perspective how tall they really are get a shot standing next to one. Lady Bird Johnson Grove Loop is an ideal spot for a stroll and giant tree spotting. Tall Trees Grove is another unmissable spot for capturing the redwoods on camera. Other places to see big trees in California include Sequoia National Park; General Sherman stands at 275ft and has a diameter of 25ft. 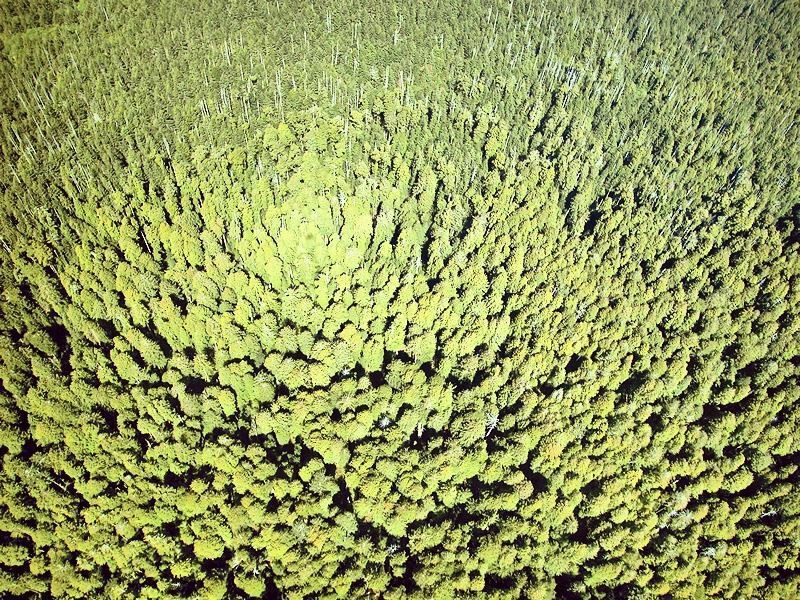 While not the tallest, by volume it is the largest living tree in the world. Arrive at the Giant Forest early to capture General Sherman without the crowds. On the border of California and Nevada, the sparkling waters of Lake Tahoe are a year round outdoor playground, there are 72 miles of shoreline to explore. South Tahoe has some beautiful spots for hiking, swimming and kayaking. Relax on a beach by the lake and take a champagne boat cruise at sunset. Hire a bike and head off on a scenic cycle along the South Lake Tahoe Bike Path, stop for a picnic and a swim along the way. 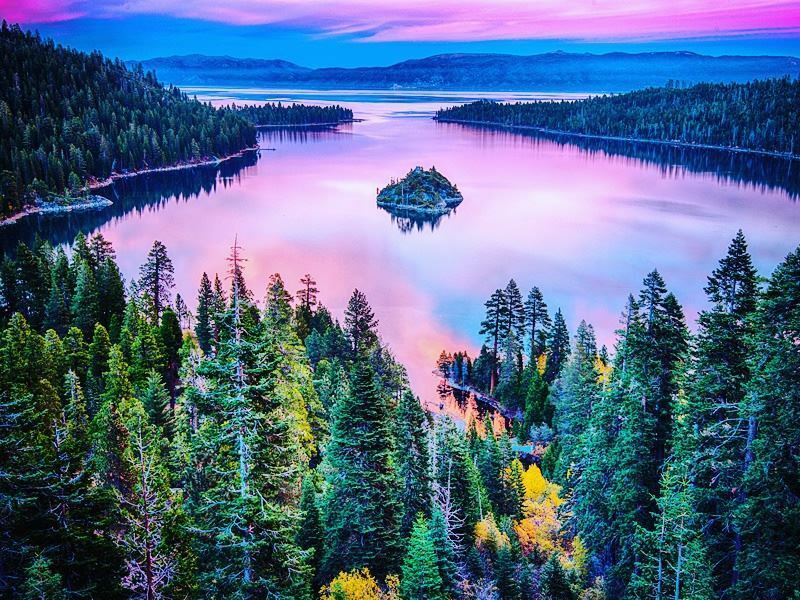 Get the shot: Take to the water in a kayak to capture some fun images on the lake or beach up at the stunning Emerald Bay, this popular photography spot has crystal clear waters with a forested backdrop. For a birds a view ride the Heavenly Gondola up to the observation deck at 9,123ft, there are wonderful views of the lake and beyond. California is well known for its beaches and beautiful coastline, Davenport Beach is 67 miles from San Francisco and a great beach to stop off at on a drive along the coast. Dramatic cliffs, caves, rock pools and rocky sea stacks make this stretch of coastline picture perfect. An hours drive further south along Highway 1 is Monterey, teaming with sea life head hear to watch sea otters floating in the sunshine and sea lions barking by Fisherman’s Wharf. Pfeiffer Beach on the Big Sur is a beauty, jade coloured waters, glistening white sand and a dramatic cliff backdrop. A huge rock with an archway through the middle known as Heaven’s Gate is an interesting landmark on this beautiful crescent shaped beach. In complete contrast bustling Malibu has plenty of beaches to choose from, Malibu Surfrider Beach is as the name suggests an awesome place to surf and catch some rays. 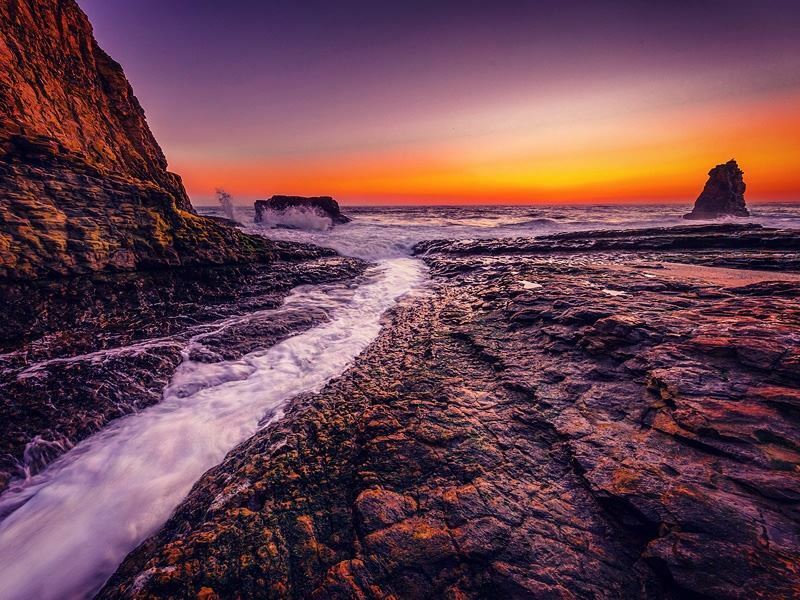 Get the shot: Arrive at Davenport beach at sunset for fantastic photos of the silhouetted sea stacks, aim for sunset at Pfeiffer Beach too and capture the suns rays through the archway in the rocks just before it disappears, don’t forget to snap up the purple coloured sand too. In Malibu take photos of surfers in action from the pier. To capture Monterey’s wildlife take a stroll along Monterey Bay Coastal Recreation Trail stopping at Fisherman’s Wharf to see the sea lions. 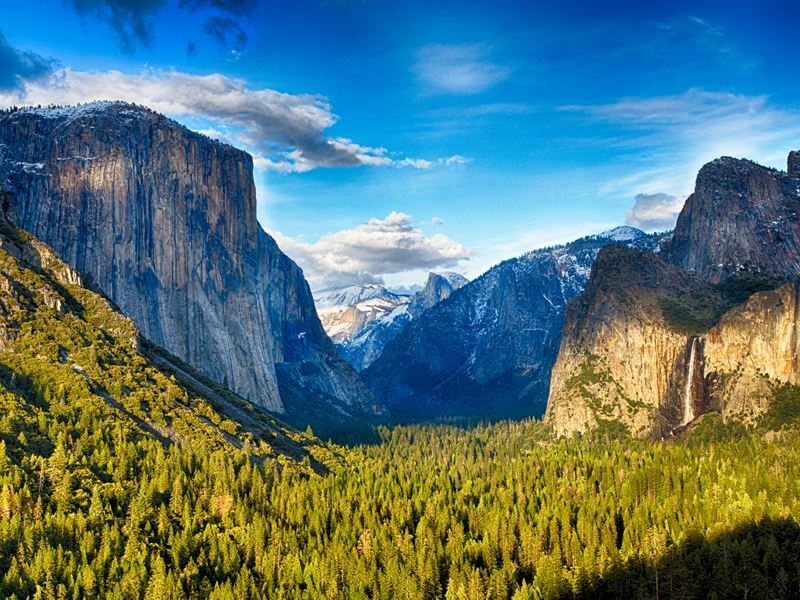 Yosemite is full of big views, so much so you probably won’t be able to put your camera down. Mountains, meadows, lakes, glaciers and giant trees are all photo worthy landmarks. A year round outdoor playground, white water rafting, hiking, climbing and skiing are just a few of the adventures to be had here. For jaw dropping views of Yosemite Glacier Point at 7,214ft is a must. Take in the beautiful view and snap up a shot of Half Dome, this huge rounded granite rock is a well-known feature of the park. Yosemite certainly knows how to do waterfalls; there are thousands to admire. Yosemite Falls, Sentinel Falls and Bridalveil are just a few to be discovered with Yosemite Falls being the tallest at 2,400ft. While Bridalveil is relatively small in comparison at 617ft it has to be one of the most photographed and can be seen from many different spots in the park. Get the shot: Plunging high from a rocky cliff face at 617ft Bridalveil Falls is an incredible sight and can be witnessed from many different viewpoints making it a fun one to capture on camera. See the falls up close on an easy walk to the base and get a fantastic shot of the water thundering down from high above. The falls make for just as a dramatic photo from a distance and can be seen from Tunnel View. From this famous view point Yosemite Valley, Bridalveil and Halfdome can all be seen, as well as dramatic rocky peaks rising from lush green forest. For a similar money shot but with less crowds hike up to Inspiration Point and admire this slightly more elevated view of the falls and Yosemite Valley.